The cycle of the Earth’s waters is continuous, carrying and spreading pollutants introduced by human activity all around the planet. To achieve maximum production, intensive farming uses chemical fertilizers responsible for various forms of air and water pollution. Certain underground gas tanks leak, discharging hydrocarbons into the water table. Pesticide residue is found in the water table and in watercourses; it makes water unfit for consumption. Wastewater leakage from a dwelling’s underground tank contaminates the water table. Burying household waste without taking any particular precautionary measures leads to contamination of the water table. Untreated, it contains organic matter (e.g., bacteria, viruses) and potentially pathogenic substances that cause infection and promote the growth of algae. Pollution caused by leaks from refineries and offshore drilling platforms, by ships emptying their fuel tanks at sea and by oil spills. Radioactive nuclear waste was once immersed at the bottom of the ocean; it has a life span of up to 1,000 years. 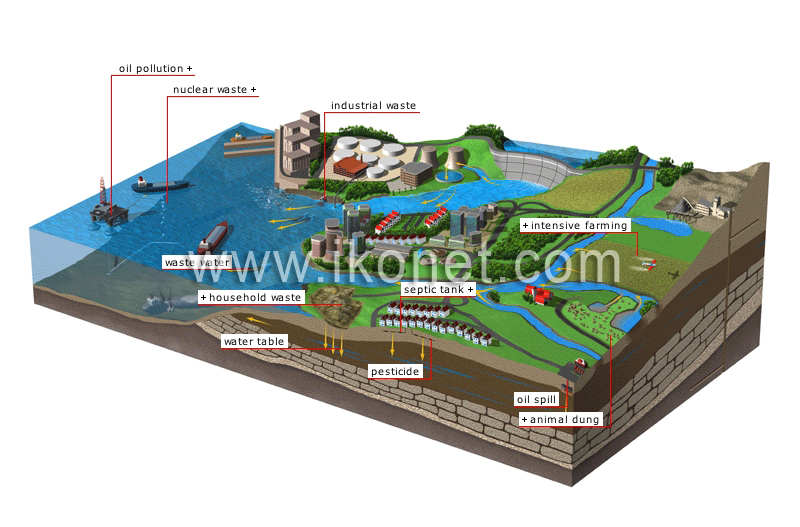 Industrial waste is highly variable; its principal components are lead, mercury, cadmium, hydrocarbons and acid deposits.